As a business owner, you probably have a security system installed in your business. This security alarm system helps to secure your facility and keep the people and property that belongs to your business. Most often, when people think of a “security alarm system” for their business they think of a very simple solution: A keypad at an entrance to arm and disarm the system, some detectors to sense intrusions when the system is armed, and a connection to a professional monitoring company to alert keyholders and authorities in the event of alarms from the site. Alarm.com has an app which is installed on your smartphone, and a web portal through which you can access your alarm account. 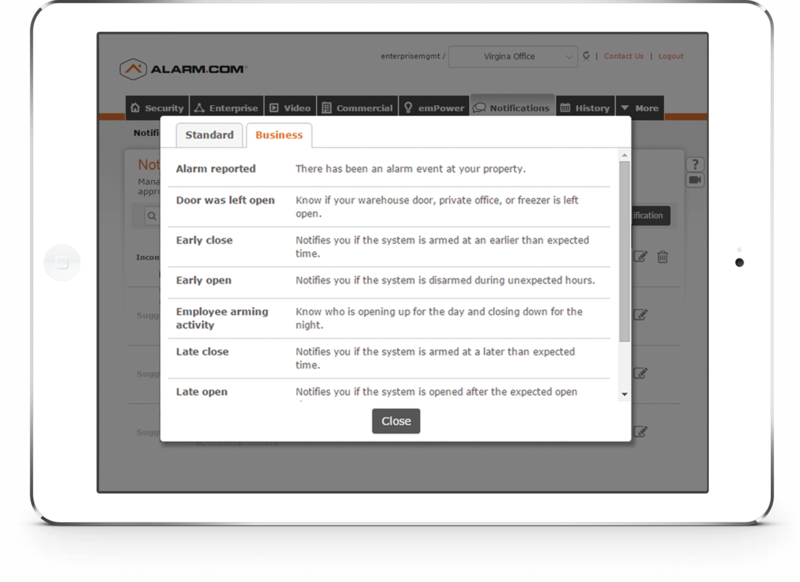 Through these portals, Alarm.com enables you to set up alerts on any device at any time – even when the system is disarmed. If you want to know if doors are being propped open during the day, these alerts can be set up. If you want to know when people are entering sensitive areas, notifications can be sent in real time to authorized people. Any device which is connected to your intrusion system can be set up to deliver these types of alerts, providing you real-time updates on how and when things are happening at your business. 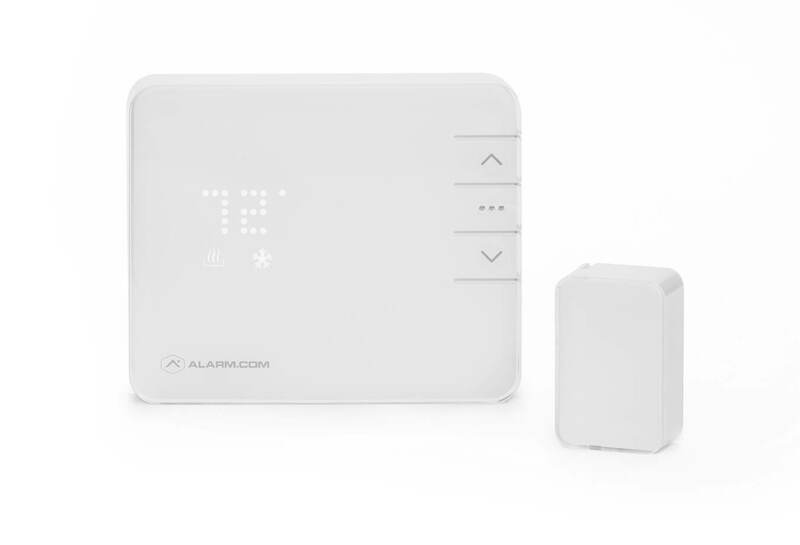 Alarm.com can be connected to thermostats in your business, allowing you to view and control the temperature in your building or unit remotely at any time through the Alarm.com app. You can also sync up how your business is heated or cooled by whether or not people are actually on site. The system can be programmed so that when the intrusion alarm system in your business is disarmed, the temperature is automatically adjusted to a comfortable level, and when it is armed up and no one is on site it is adjusted to a higher or lower level (depending on the season) so that you are not heating or cooling an “empty space”. This can have potential major impacts on your hydro bills, as the heating and cooling requirements. Another feature with this connection to your heating and cooling system is similar to the first feature above. Alerts and Alarms can be set up so that if the temperature in your facility drops below a certain level (which is customizable), an alert can be sent to the appropriate people. This can have potentially major impacts on a business in the event the power drops out in the winter and pipes in the business freeze. Similarly, “high temperature” alarms can be set up to protect valuable equipment in server rooms and other areas from overheating. These all have potentially major financial impacts on your business. As we’ve seen in many jurisdictions throughout Canada recently, Police Departments are moving towards a verified response model of alarm response. What this means for you as the business owner is that in many areas, Police will no longer respond to alarms, or at the very least will lower their priority of response to calls from security alarm systems unless the alarm can be verified as valid. One of the methods of verification is through live video from the site, and in previous blog posts we’ve discussed how video verification has been proven to improve police response and increase apprehension rates when used in coordination with a security alarm system. 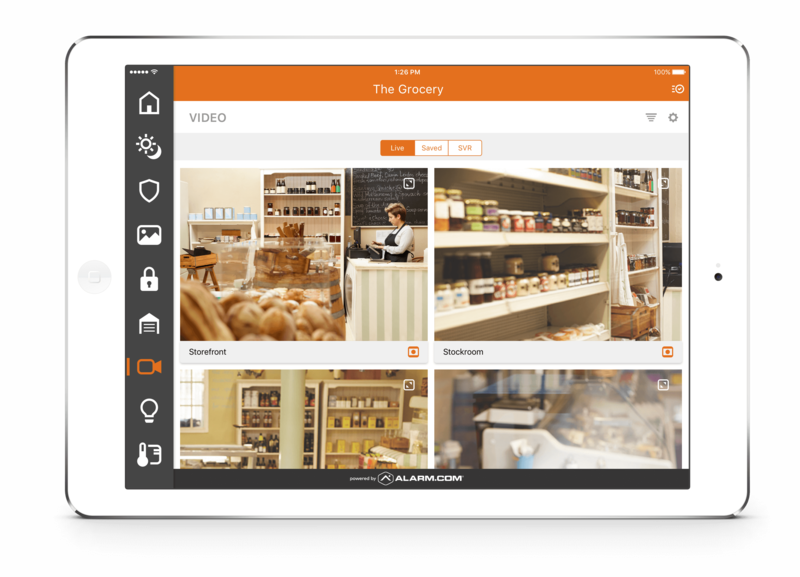 Alarm.com integration can bring those video feeds directly to you for live look-ins, or coordinated video that appears to you when an alarm or alert has been triggered on at your business. 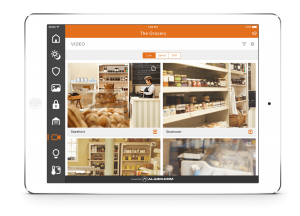 This gives you real-time access to what’s going on in your business, and allows you to prioritize emergency response in the event of an actual break in. Live video can also be pushed to a monitoring station when you’d prefer professionals be the ones making determinations on events happening on site. With these great features, you can leverage your commercial security alarm system – and this can even work with some existing systems – to provide greater insights into how your business is being run bringing more value to the system and your investment. Through the app you can monitor multiple locations, get reports and see how your businesses are operating, when they are actually opening and closing every day, and many other insights into your business. Fire Monitoring of Canada is an Alarm.com authorized dealer, and can provide all of these services to you, while maintaining a professionally monitored and serviced security alarm system in our ULC-listed monitoring station. Alarm.com can even work on existing systems. Contact us to find out more about this service and how we can work with you to improve your business.